Our luxury mobile home is an ABI Brisbane 35×12, two bedroom model. 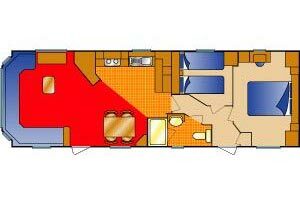 Size does make a difference; the spacious accommodation offers 50% more floor area than the 28×10 fleet homes. An added bonus for early and late holidays is the fact that our home is equipped with double glazing, full central heating and, as a relief from the hot balmy summer days, remote controlled air conditioning. Features include a large lounge equipped with comfortable seating units, a wall light, coffee table, TV, DVD player, Freeview satellite box, radio/CD/cassette player, net curtains, co-ordinated fabrics, underlay to carpet and domestic casement doors. 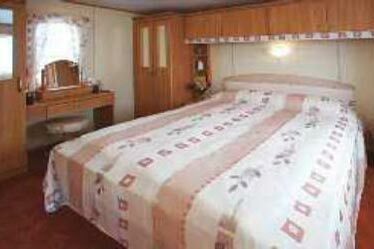 A pull-out Cosmo bed can accommodate two guests. 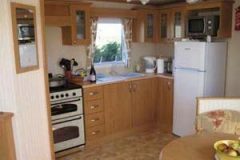 The kitchen boasts a domestic size sink, extra width oven, a fridge/freezer, microwave oven and plenty of cupboards and storage space. The bathroom features a ceramic toilet suite, wash basin with vanity unit above and cupboards below, and a glass door to the spacious shower cubicle. 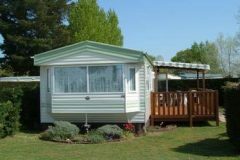 A large plot enclosed on three sides by established hedges to ensure privacy and one in a particularly sunny location, you can relax on the adjoining 7m x 2.5m wooden terrace. Duvets, blankets and pillows are provided so all you need are the duvet covers, sheets, pillowcases, towels and tea towels.